On a recent clothes shopping trip to France, you know, France of haute couture and all, I saw this on a t-shirt in the boys' department. ???!!! 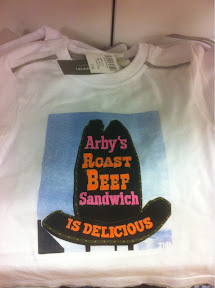 My Dad would be elated -- Arby's is his favorite restaurant.